It’s been three years since I first began work on BUTTERFLY, and two years since the film first premiered at the Chicago International Film Fest. But it’s taken me till now to finally dig through the scads of pics, rehearsal images, and pre-production tests in order to share some of the original work that gave rise to the film. BUTTERFLY began as prose, a series of passages detailing the intense highs felt when immersed in meaningful creative work, and the stinging withdrawal that begins once the work is complete. 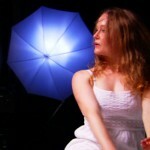 The resulting film centers on a man (Christopher Prentice as “Derek”) lost and disconnected within his photography studio… until the appearance of his muse/model/love/passion (Kirsty MacKellar as “Dancer”) inspires him to back to life. I spent nearly a year crafting this relatively simple idea into the final short film… In fact, I officially shot the entire film two different times, nearly four months apart… Needless to say, there’s a lot more to the BUTTERFLY story which I’ll continue to share in installments, along with some great Test and Behind the Scenes pics later this week. For now, here’s an initial selection of production stills from the film to whet your appetite… Bon Appetit!